Neil Goldberg, from the ongoing series Inhibited Bites, ca. 1999 - present. Neil Goldberg, Inhibited Bites (performance), 2018. Photo by John Muggenborg. Neil Goldberg, Inhibited Bites: (Magic) Box Set, ca. 1999 - present. 1,000+ index cards, ink and spinning vitrine. vitrine: 43 5/16 x 51 5/16 x 20 inches (110 x 130.33 x 50.8 cm). Neil Goldberg, Inhibited Bites: (Magic) Box Set (detail), ca. 1999 - present. 1,000+ index cards, ink and spinning vitrine. vitrine: 43 5/16 x 51 5/16 x 20 inches (110 x 130.33 x 50.8 cm). Neil Goldberg, Inhibited Bites: Vortex Version, 2018. single-channel HD video. 9:05 minutes. Neil Goldberg, My Father's Camry Filled with Leaves, 2009. inkjet print. 33 3/4 x 42 3/4 inches (85.7 x 108.6 cm). Neil Goldberg, A System for Writing Thank You Notes, 2001. single-channel video. 8:30 minutes. Neil Goldberg, Inhibited Bites: The Suburban, 2017. inkjet print on archival paper. 37 5/8 x 47 inches (95.6 x 119.4 cm). Neil Goldberg, Other Peoples' Prescriptions, 2018. suite of 8 inkjet prints on archival paper. each: 12 x 16 inches (30.5 x 40.6 cm). Neil Goldberg, Other Peoples' Prescriptions (detail), 2018. suite of 8 inkjet prints on archival paper. each: 12 x 16 inches (30.5 x 40.6 cm). 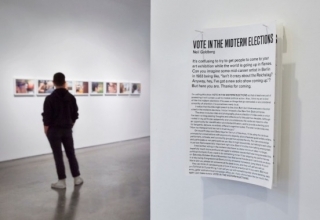 Cristin Tierney Gallery is pleased to present Neil Goldberg: VOTE IN THE MIDTERM ELECTIONS. The exhibition opens on Thursday, October 25th with a reception from 6:00 to 8:00 pm. 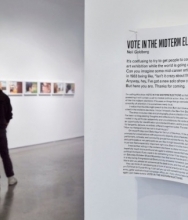 The artist will be present, as will members of The Creative Resistance, who will sign up volunteers to canvas for the midterms. 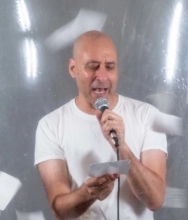 This is Goldberg’s first solo show with the gallery, and includes video, photography, and performance. VOTE IN THE MIDTERM ELECTIONS continues through Saturday, December 15th. Goldberg’s exhibition title is a call to action and an acknowledgment of the horrific and surreal context in which this show opens. It is also reflective of the artist’s engaged approach to the place and time he inhabits. A longtime New Yorker, Goldberg frames and illuminates often overlooked moments of beauty, absurdity, and humanity within a constantly changing and at times chaotic urban setting. Each project mirrors our world back to us, asking us to look closer and attune ourselves to the act of attention itself. Goldberg's call to vote, pragmatic and inciting even couched within the good-humored fatalism of his work, is an extension of this methodology. The personal biography referenced in Goldberg’s cards, in particular his relationship with his father, is a significant theme of VOTE IN THE MIDTERM ELECTIONS. 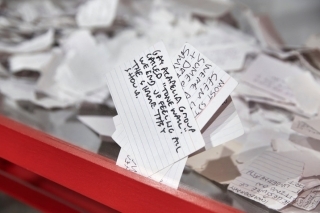 The index cards are housed in a spinning device that is part art vitrine, part magic trick. 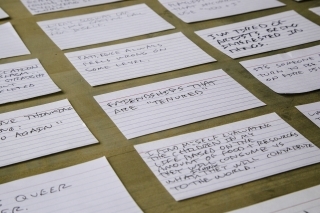 Shuffling the contents with each turn and randomizing the artist’s selections, it de-sanctifies the presentation of a project that had always been spontaneous. Its DIY, carnivalesque aesthetic alludes to the magic tricks and games he created with his father in his youth—a collaboration that was decisive in his becoming an artist. 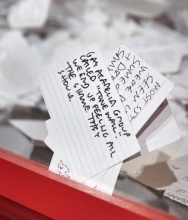 A video in the exhibition, A System for Writing Thank You Notes, features Goldberg’s father describing the method he devised for composing letters to all of the people who expressed their condolences upon his wife’s passing. 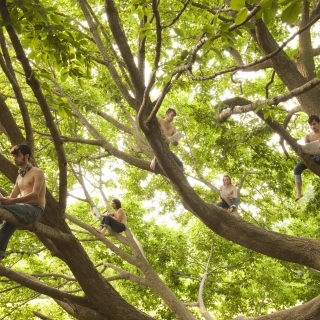 The attention to language and the interest in social ritual and interpersonal connection bears a family resemblance to the logic behind Inhibited Bites. 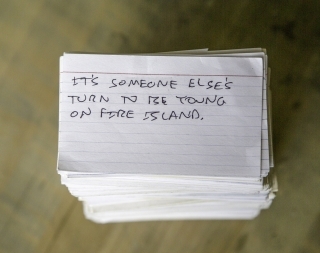 On Fridays and Saturdays the artist will use his index cards as prompts for conversations with anyone who stops by, plus scheduled guest artists, writers, performers, activists, and community groups from across the city. Goldberg will skip two Saturday performances before the Midterm Election Day to knock on doors in a nearby swing district. If you are interested in helping the artist turn out the vote this fall by canvassing neighborhoods or helping with phone banking, data entry, or more, please contact us at info@cristintierney.com.